Disclaimer: The participating bloggers were not compensated for this post. No purchase is necessary to enter. One entrant per household, per IP address. All entries will be verified. Void where prohibited by law. Winner will be contacted by email; Please add ninamcclain93@gmail.com to your whitelist. Mogo Products will be responsible for prize delivery to the winner. This giveaway is in no way administered, sponsored, endorsed by, or associated with Facebook and/or Twitter, Google, Pinterest, or any other social media platform. Contact Nina at ninamcclain93@gmail.com if you have any additional questions or comments, or would like Stingy, Thrifty, Broke to organize your next giveaway. I think these would be great to try and try to help the pain in my hands. I do not like to take too much pain meds. I would love to win and try these. I enjoy trying more natural and effective products. I want to win these to give to my mom. She has issues with pain in her hands. I love to try different products like this! I never heard of Acupressure Massage rings before this. It would be worth a try to get some relief. 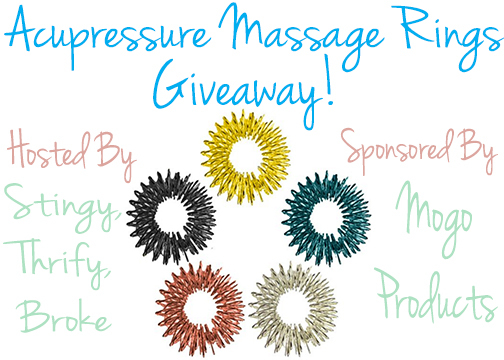 I would like to win the Acupressure Massage rings in hope that it would help eliminate the cramping in my hands.